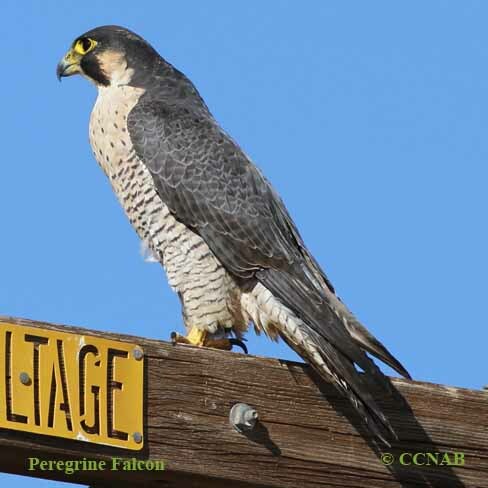 Species; The Peregrine Falcon (Falco peregrinus), once called the "Duck Hawk" is found on all the continents, except Antarctica. In North America there are at least three sub-species, the Tundra and Peale's are the best known. 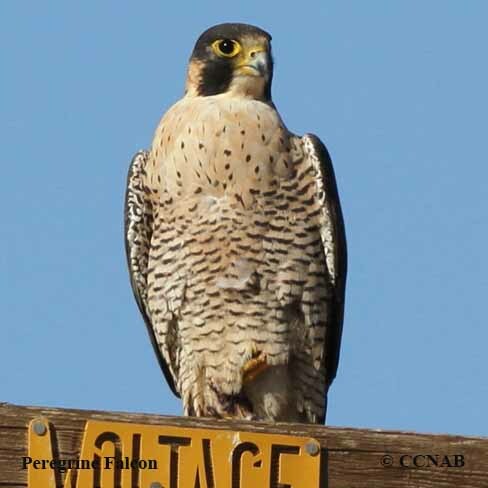 One of the top choices used by falconers for centuries. 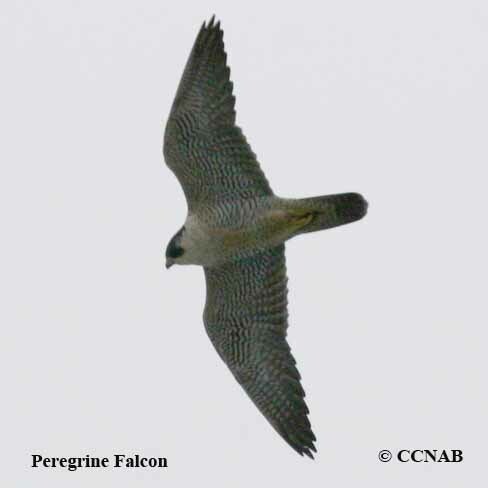 Peregrine Falcon takes its prey on the wing, typically striking them from above, or chasing them down. Records have shown, when in a stoop (dive), speeds of over 250 miles per hour are achieve and more. 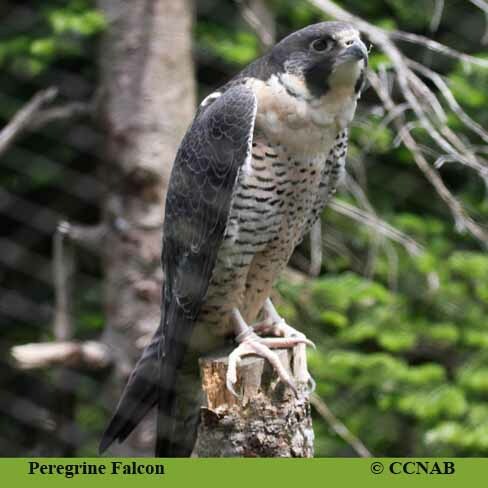 These falcons were put on the endangered list because of the their very low numbers in the 1960's and 70's, because of the damages of DDT, a pesticide, which caused eggs to be develop with very thin shells, breaking before the chick could develop. 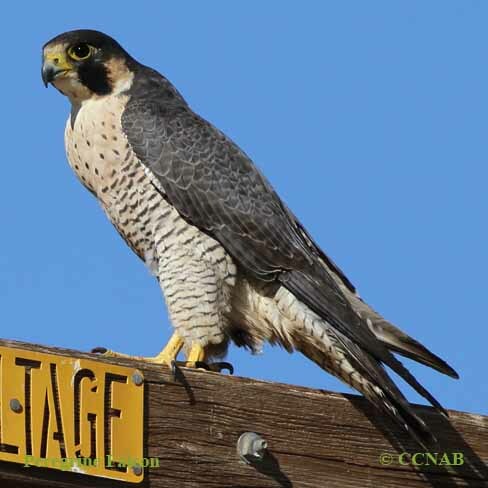 Today, because of conservation, and the efforts of the birding communities, these falcons are increasing in numbers, found throughout cities and water ways. Distinctions; Male and female are similar, female larger of the two. 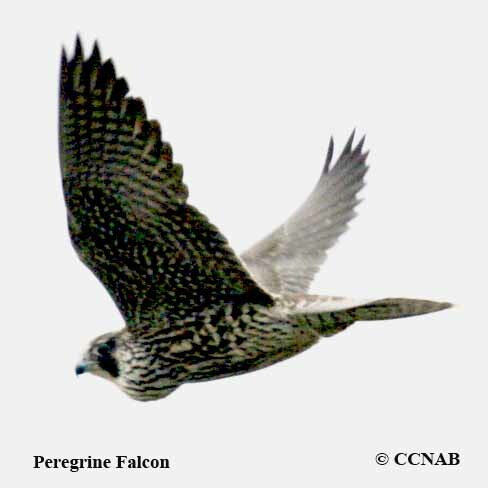 Blue to grayish blue back, dark head, dark feathers extending down sides of neck, representing moustaches, long pointed wings, checkered beneath, white upper breast, with thin dark barring below, double toothed identifying it a member of the falcon family. Able to soar, strong, rapid wing beats, extending from high over body, to equal far below body. Juvenile similar to parents, except browner, with bolder streaking on breast. Voice; Similar to other hawks' cries, sounds like kack-kack-kack. Nesting; Three to four cream coloured eggs, with brown marking, one brood per year. Nest built on high ledges on cliffs, tall buildings, bridges or man-made towers, most likely near a source of water. Nest shaped out with small amount of materials. Distribution; Summer breeding range is across the arctic, from Northern Quebec to Western Alaska. Breeds along the Pacific coastlines from Alaska to California. Throughout the Rocky Mountains into Mexico. Common breeder in many cities in the eastern regions. Seen along all the eastern coastlines, from Newfoundland, south to Florida, west to Texas.